Heating mantles are used for heating or tempering organic liquids placed in reaction kettles, round-bottomed flasks, or relevant reaction vessels required for the boiling, evaporation, distillation, or extraction process. The products are designed using all-fiberglass or have an aluminum outer shell and are available in many sizes. Heating mantles are available as stirring or non-stirring types, with controllers and without controllers. The products can obtain different ranges of temperature and have varied temperature regulation levels. 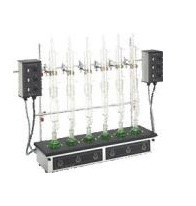 Heating mantles provide short heat-up duration, even distribution of heat without creating condensed water, and are used in laboratories. The products do not produce flames and are safe for heating above 100 °C. Once submitted, we will try and place you in contact with a suitable Heating Mantles supplier within 48 hours.